For equivalent regional tools, refer toSpecial Tools and Equipment. This procedure is designed to fine-tune the balance of apropeller shaft while it is mounted in the vehicle. Small amountsof residual imbalance which could be present in other relateddriveline system components could be compensated for as a result ofperforming this procedure. The end result of properly fine-tuning apropeller shaft balance may be either a significant reduction or anelimination of a vibration disturbance that is related to thefirst-order rotation of a propeller shaft. Fine-tuning the balance of a propeller shaft can aid inachieving a more balanced total driveline system. Note:The runout of the propeller shaft to be balanced and therunout of the components that the propeller shaft mates to must bewithin tolerances before an attempt should be made to perform thisprocedure. IfEL-38792-Aelectronic vibrationanalyzer-(EVA)-2is available, use the following procedure, AdjustmentProcedure Using EVA. If the EVA-2 is not available, usethe second procedure, Adjustment Procedure Without EVA. Caution:Do not depress the brake pedal with the brake rotors and/orthe brake drums removed, or with the brake calipers repositionedaway from the brake rotors, or damage to the brake system mayresult. Raise and support the vehicle; ensure that the drive axle oraxles are supported at ride height – vehicle bodysupported by suspension components.With the tire and wheel assemblies, and the brake rotorsand/or brake drums removed from the drive axle, or axles, start theengine and turn OFF all engine accessories.Place the transmission in forward gear.Run the vehicle at the speed which causes the most vibrationin the propeller shaft; observe which end of the propeller shaftexhibits the greatest amount of vibration disturbance.Turn the engine OFF to slow and stop the rotation of thepropeller shaft. Mark the circumference of the propeller shaft-(1)to be balanced at four points 90-degreesapart-(2), nearest the end that exhibited the greatestamount of vibration. Number the marks 1–4.Install theEL-38792-AEVA-2, theEL-38792-276-foot EVA power cord extension, theEL-38792-25inductive pickup timing light, or equivalent, and theEL-38792-2020-foot extensionto the vehicle.Connect the clip of theEL-38792-25inductive pickup timing light, or equivalent, onto the trigger wire of theEL-38792-AEVA-2.Mount theEL-38792-AEVA-2vibration sensor to the bottom of the driveline componentnearest to the end of the propeller shaft that exhibited thegreatest amount of vibration. Ensure that the side of the sensor marked UP faces upward andthat the sensor is positioned as close to horizontal aspossible. Plug the vibration sensor cord into Input-A of theEL-38792-AEVA-2. Input-B is not used with the strobefunction.Run the vehicle at the speed which causes the most vibrationin the propeller shaft; observe the frequency readings displayed ontheEL-38792-AEVA-2. Note:Do NOT continue with fine-tuning the balance of a propellershaft if the dominant frequency displayed is not related to thefirst-order rotational speed of the propeller shaft. Verify that the dominant frequency displayed on theEL-38792-AEVA-2matches the recorded frequency of the vibrationconcern.Record the amplitude reading of the dominant frequencydisplayed.Using the strobe function of theEL-38792-AEVA-2, select the correct filter range to use for the balanceadjustment, so that the dominant frequency would be near the middleof the filter range. 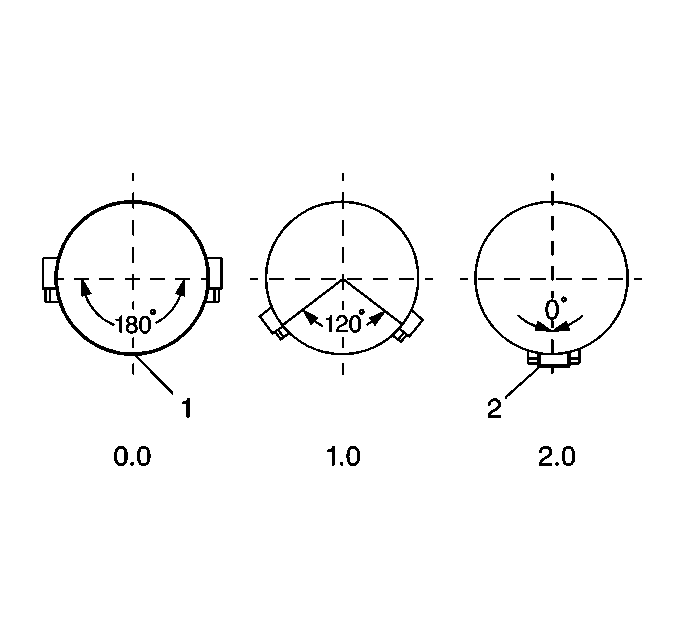 Use the full range filter only as a lastresort if one of the specific range filters will not cover thefrequency adequately.TheEL-38792-AEVA-2display will show the dominant frequency, the amplitudeand the selected filter range.Aim theEL-38792-25inductive pickup timing light, or equivalent, at the marks placed on the propellershaft. When activated, the strobe effect will appear to freeze themarks placed on the rotating propeller shaft. Record which of thenumbered marks appears to be at the bottom of the propeller shaft,or the 6-o'clock position. This position identifies thelight spot of the propeller shaft.Turn the engine OFF to slow and stop the rotation of thepropeller shaft.Install a band-type hose clamp as a weight, with the head ofthe clamp directly on the light spot.Run the vehicle at the speed which causes the most vibrationin the propeller shaft.Using theEL-38792-25inductive pickup timing light, or equivalent, observe the positioning of the marksplaced on the propeller shaft.If the marks on the propeller shaft now appear to moveerratically, compare the current amplitude of the vibrationfrequency to the original amplitude recorded previously. If the amplitude has decreased from the amplitude recorded,the balance achieved may be sufficient and the vehicle should beroad tested to determine the effect on the vibrationconcern. If the clamp head over the original light spot, is now nearthe top of the propeller shaft, within 180-degrees– near or below the 12-o'clock position– of the original position at the bottom of the propellershaft – 6-o'clock position – theposition of the weight needs adjusting. Perform the followingsteps:Move the position of the clamp head toward the6-o'clock position.Using theEL-38792-25inductive pickup timing light, or equivalent, recheck the positioning of the propellershaft marks.If necessary, continue to move the position of the clamp headtoward the 6-o'clock position and recheck progress untilan improvement in balance is achieved. If the clamp head over the original light spot, is stillpositioned at the bottom of the propeller shaft –6-o'clock position – additional weight isrequired. Perform the following steps:Add a second clamp to the propeller shaft, next to the firstclamp and with the clamp heads aligned.Using theEL-38792-25inductive pickup timing light, or equivalent, recheck the positioning of the propellershaft marks.If the clamp heads over the original light spot, are now90–180-degrees – at or above the9-o'clock or the 3-o'clock positions– from the original position at the bottom of thepropeller shaft – 6-o'clockposition-(1)- – less total weightis required. Proceed to step-23.4.Move the position of the clamp heads an equal distance oneither side of the light spot between1-and-120-degrees apart from eachother to reduce the total amount of weight in relation to the lightspot.Using theEL-38792-25inductive pickup timing light, or equivalent, recheck the positioning of the propellershaft marks.If necessary, continue to move the position of the clampheads an equal distance on either side of the light spot to amaximum of 120-degrees apart from each other, until thegreatest improvement to balance is achieved.If improvement has been made to the balance of the propellershaft, but the balance is still not satisfactory, still more totalweight may be required. Perform the following steps:Add a third clamp to the propeller shaft, next to the firstand second clamps and with the clamp headdirectly-(2)-on the light spot.Move the position of the first and second clamp heads anequal distance on either side of the light spot between1-and-120-degrees apart from eachother to arrive at a total amount of weight greater than twoweights, but less than three weights in relation to the lightspot.Using theEL-38792-25inductive pickup timing light, or equivalent, recheck the positioning of the propellershaft marks.If necessary, continue to move the position of the first andsecond clamp heads an equal distance on either side of the lightspot to a maximum of 120-degrees apart from each other,until the greatest improvement to balance is achieved.If a third clamp was used on the propeller shaft andsufficient balance could still not be achieved, the propeller shaftrequires replacement.If the clamp head over the original light spot is now90–180-degrees – at or above the9-o'clock or the 3-o'clock positions– from the original position at the bottom of thepropeller shaft – 6-o'clock position– less total weight is required. Perform the followingsteps:Add a second clamp to the propeller shaft, next to the firstclamp and with the clamp heads aligned.Move the position of the clamp heads an equal distance oneither side of the light spot between120-and-180-degrees apart fromeach other to reduce the total amount of weight in relation to thelight spot.Using theEL-38792-25inductive pickup timing light, or equivalent, recheck the positioning of the propellershaft marks.If necessary, continue to move the position of the clampheads an equal distance on either side of the light spot to amaximum of 180-degrees apart from each other, but notless than 120-degrees apart, until the greatestimprovement to balance is achieved.If the marks on the propeller shaft now appear to moveerratically, compare the current amplitude of the vibrationfrequency to the original amplitude recorded previously. Raise and support the vehicle; ensure that the drive axle, oraxles are supported at ride height – vehicle bodysupported by suspension components.With the tire and wheel assemblies, and the brake rotorsand/or brake drums removed from the drive axle or axles, start theengine and turn OFF all engine accessories.Place the transmission in forward gear.Run the vehicle at the speed which causes the most vibrationin the propeller shaft; observe which end of the propeller shaftexhibits the greatest amount of vibration disturbance.Carefully hold a piece of chalk up to the end of thepropeller shaft in order to just make contact as the shaftrotates.Turn the engine OFF to slow and stop the rotation of thepropeller shaft.Observe the location of the chalk mark on the propellershaft.If the chalk mark circles the entire propeller shaft afterthe first attempt, remove the mark from the shaft and repeat steps2 through 7; touch the chalk more gently to the propellershaft.If the chalk mark circles the entire propeller shaft afterthe second attempt, runout of the propeller shaft may not be thecause of the disturbance. Proceed to step-16.If the chalk mark is only on a small portion of the propellershaft, the mark identifies the heavy spot of the propeller shaft.The heavy spot of the propeller shaft will deflect downward duringrotation. Place a small mark on the shaft 180-degrees,directly opposite the heavy spot, and identify the mark as thelight spot. 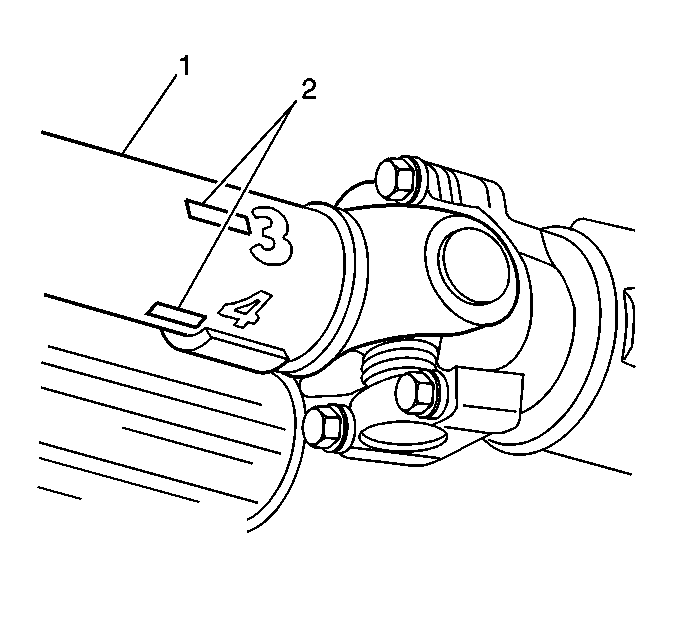 Proceed to step-8.Install a band-type hose clamp to the propeller shaft as aweight, with the head of the clamp directly on the light spot, or180-degrees, directly opposite the heavy spot.Observe the amount of disturbance to the propellershaft.If the amount of disturbance to the propeller shaft appearsto be significantly reduced, the balance achieved may be sufficientand the vehicle should be road tested to determine the effect onthe vibration concern. The head of the clamp can be moved veryslightly, if necessary to refine the balance achieved.If the amount of disturbance to the propeller shaft appearsto be almost unchanged or even increased, proceed tostep-10.Add a second clamp to the propeller shaft, next to the firstclamp and with the clamp heads aligned.Observe the amount of disturbance to the propellershaft.If the amount of disturbance to the propeller shaft appearsto be significantly reduced, the balance achieved may be sufficientand the vehicle should be road tested to determine the effect onthe vibration concern. The head of the clamps can be moved veryslightly an equal distance apart on either side of the light spot,or moved slightly while still aligned, if necessary to refine thebalance achieved.If the amount of disturbance to the propeller shaft appearsto be almost unchanged or even increased, proceed tostep-12.Move the position of the clamp heads an equal distance oneither side of the light spot between1-and-120-degrees apart from eachother to reduce the total amount of weight in relation to the lightspot.Observe the amount of disturbance to the propellershaft.If the amount of disturbance to the propeller shaft appearsto be significantly reduced, the balance achieved may be sufficientand the vehicle should be road tested to determine the effect onthe vibration concern. If necessary, continue to move the positionof the clamp heads an equal distance on either side of the lightspot to a maximum of 120-degrees apart from each other,until the greatest amount of reduction in the vibration disturbanceis achieved.If the amount of disturbance to the propeller shaft appearsto be almost unchanged or even increased, proceed tostep-14.Add a third clamp to the propeller shaft, next to the firstand second clamps and with the head of the clamp directly on thelight spot.Observe the amount of disturbance to the propellershaft.If the amount of disturbance to the propeller shaft appearsto be significantly reduced, the balance achieved may be sufficientand the vehicle should be road tested to determine the effect onthe vibration concern. If necessary, continue to move the positionof the first and second clamp heads an equal distance on eitherside of the light spot to a maximum of 120-degrees apartfrom each other, until the greatest amount of reduction in thevibration disturbance is achieved.If the amount of disturbance to the propeller shaft appearsto be almost unchanged or even increased after a third clamp wasused on the propeller shaft, the propeller shaft likely requiresreplacement.If the heavy spot of the propeller shaft could not beidentified, install a band-type hose clamp to the propeller shaftas a weight, with the head of the clamp directly in-line with anexisting factory-installed weight.Observe the amount of disturbance to the propellershaft.If the amount of disturbance to the propeller shaft appearsto be significantly reduced, the balance achieved may be sufficientand the vehicle should be road tested to determine the effect onthe vibration concern. The head of the clamp can be moved veryslightly, if necessary to refine the balance achieved.If the amount of disturbance to the propeller shaft appearsto be almost unchanged or even increased, proceed tostep-18.Move the head of the clamp 180-degrees, directlyopposite the factory-installed weight.Observe the amount of disturbance to the propellershaft.If the amount of disturbance to the propeller shaft appearsto be significantly reduced, the balance achieved may be sufficientand the vehicle should be road tested to determine the effect onthe vibration concern. The head of the clamp can be moved veryslightly, if necessary to refine the balance achieved.If the amount of disturbance to the propeller shaft appearsto be almost unchanged or even increased, the propeller shaft mayrequire replacement.